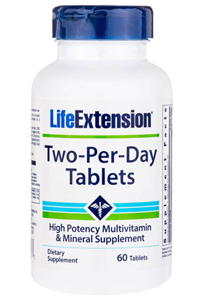 Life Extension's Two Per Day Multivitamin Tablets have the highest nutritional potencies of any science-based multivitamin formula that can fit inside two capsules or tablets. This gives you far more of the essential vitamins, minerals and health-promoting nutrients than typical store-bought formulas - all at a very economical price. Why is this so important? While Recommended Daily Allowances (RDAs) were developed by the government, they only provide the minimal doses to protect you from deficiency. Research studies demonstrate that unless you're taking the ideal dose of vitamins and minerals, you won't fully receive their benefits for optimal health and well-being. 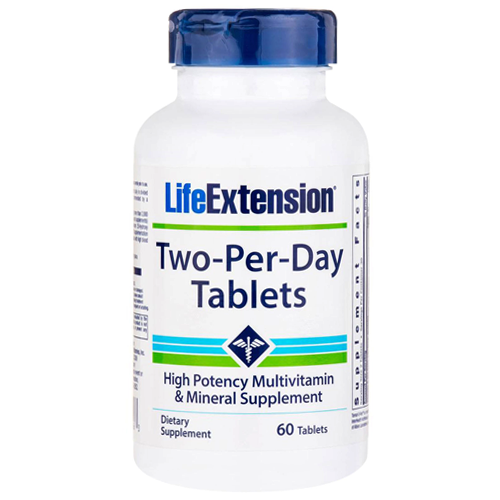 Life Extension Two-Per-Day Tablets now contains three potent forms of selenium (SelenoExcell, Se-methyl-selenocysteine and sodium selenite). Also new to Two-per-Day Tablets is apigenin, a powerful bio-flavonoid found in many vegetables and fruits which boosts cell protection. Read the entire label and follow the directions carefully prior to use. Take two (2) tablets daily in divided doses with meals, or as recommended by a healthcare practitioner. Stearic acid, croscarmellose sodium, vegetable stearate, silica, aqueous film coating (purified water, hydroxypropyl methylcellulose, glycerin), microcrystalline cellulose, maltodextrin. Individuals consuming more than 2,000 iu/day of vitamin D (from diet and supplements) should periodically obtain a serum 25-hydroxy vitamin D measurement. Vitamin D supplementation is not recommended for individuals with high blood calcium levels. Store tightly closed in a cool, dry place. Keep out of reach of children. Do not exceed recommended dose. Do not purchase if outer seal is broken or damaged. When using nutritional supplements, please consult with your physician if you are undergoing treatment for a medical condition or if you are pregnant or lactating.